So you not direct integrate for others also ? Asset, which generates buildings using a script can not be directly integrated. 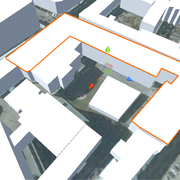 Study the Room Architect API to understand how to generate buildings. also is there a way then use from RWT like your build in script and buildr2 some OSM points to generate houses at the form shape etc from OSM with Room Architect. ? roads also not work with worldcreator terrain anymore. This is because RWT uses data about the real world elevation data. You changed the terrain heightmap, and they no longer match. the real world elevation data or the current terrain heightmap. Yes i studyed the Room Architect API but no way fiund to build / generate house at the Points from RWT wthout changing whole Room Architect . You not integrate the also for others ? Or you know a way that generate gameobjects at the points and set at them the room architect script and generate ? Also at the WorldCreator terrain it is a bit different at some points that why Houses / BUildings and then Roads not work anymore. YOu can try at my coordinates for example at terrain 3x3 when you rteplace that then withtthe gernerate from 3x3 source to WorldCreator terrain as input. Also is there a away to make the mountaibs etc higher and where river are deeper etc because much heights not look like real difference of 100 meter or more at mountain and hill etc heights . Unfortunately, I do not understand what others you mean. Please, with all questions about Room Architect and other assets, contact the developers. Please re-read the last part of my previous post. P.S. Why do you make full quotes? In this thread, only you and me. P.P.S. English is not my first language. And one wrong letter / word can make the message unreadable for me. Your messages are very difficult to read, because every fifth word contains an error. Perhaps this is not a problem for you. But for me, every your message is pain. Please check your messages before sending. Yes but thats as said is not the problem with worldcreator you can test with terrain 3x3. its that the terrain very different higher mountains and different hills where are no at RWT and not in Real. sry wrote most times from phone. whats your 1st / your language. can you send example at you script to place a prefab house at all the points getting from RWT ? Unfortunately, I do not understand what you mean. Thanks we tryed but not worrk with Room Architect. Have you tried also if it work ? and for the other things we talked you said you implement. And for better roads fitting etc. I'm not an expert in other assets, and I do not provide support for them. So please, stop asking for third-party assets. All following questions that are not directly related to our assets will be ignored. And no, I'm not angry. Yes, this is what I need, implement it. You ignored it, so I have not even started working on it yet. oh ok i thought we talked about it and i said it and you said you will implement all talked ? OK. I will implement this. But the development will take some time. No, I do not implement everything we talked about. It was just an idea, and I do not know whether it is suitable for you. ok yes no problem you not must implement all thanks. so what you will now implement ? yes i know that things to code take time. also the river osm generation ? with R.A.M ? also can you make that the osm file of roads can be used directly for easyroads3d ? because atm the osm roads has other header etc also easyroads3d dev said then when download direct from OSM . because then its easier then download for 320 terrain every coordinates typn etc . when RWT already downloaded it automatic but not work in easyroads3d because some things changed at the XML. I meant to realize the regeneration of roads and buildings on the basis of current heightmaps of terrains, instead of real world heights. We will definitely try to add support for R.A.M., but later. No, RWT can not generate OSM files for EasyRoads. This is just a cache of responses from the OSM Overpass API. copy these files, add the desired header and try using in EasyRoads. And you try also add Support for Room Architect ? and also be great with Vegetation Studio to set mask for Trees and grass better from RWT / OSM ? Oh ok but i can check your scrips and let it automatic generate the files or you can let generate them in and RWT Folder with name easyroads. i often not want integrate to much because when you bring update my changes get lost. or need to be redone. My question related to the first line. All I could do on my side with Room Architect, I did. RWT gives you points on the basis of which you need to generate a building. We will definitely try to add support for Vegetation Studio, but later. you#meant to realize the regeneration of roads and buildings on the basis of current heightmaps of terrains, instead of real world heights. Also at RWT at Easyroads3d be good that can select different road types like at easyroads3d OSM import. Because atm you only use the default and all roads need to be changed manually to other road type. So setting it before for 1 or more roads types the easyraods3d road type. and looks much diffent the file from RWT to mnormal OSM XML file. so you could add other roads generator also or and the RAM to use as road tool spline also ? Yes, I think we will add this feature. What for? This is an internal RWT cache that uses data that suits it. In this case OSM Overpass API. What is the relationship between one of the built-in features of ER3D, which is not a public API, and the internal data of RWT? I have not tested R.A.M. but in the video I did not see the intersections, which are an important part of the roads. you can make 1st like easyroad3s have it for sekect different 4oad types for OSM ar RWT. also when use RWT and buildr2 enabled in RWT and world streamer in project unity crashes and ptoject only work when remove buildr2 and delete metadata folder and wait hours to rebuild whole project. When remove buildr2 or not enable it in RWT it work . or when remve worldstreamer. but never any errors in log only crash dmp and log but there is nothing what is the problem etc . Also where RWT save the settings that for example the BuildR2 is enabled or so on ? BEcause when remove Buidlr2 and RWT and reimport RWT it shows error with Buildr2 but BUildR2 is not in project . you can make 1st like easyroad3s have it for sekect different road types for OSM ar RWT. at RWT easyroads3d atm also no intersections and connections work atm. Also will you make RWT or can you make RWT with more features than ? You can see what features etc i mean ? I answered this in the post 91. I will try to implement this in the future. But the chance of success is very small, because ER3D has 99% obfuscated code, and most likely this part is also obfuscated. I do not know what to say here. Try to look at editor log. Thanks for the link. It is very interesting. Let's wait until it's released. Development RWT will continue and we will be adding new features. I meant when you at the EasyRoads3d Generation at RWT to select different road types for different road types from OSM the XML for easyroads3d is not needed. Aslo can you make like the CityGen3D to set at Building generation not only the default builtin or the BuildR2 also that clients can set prefabs of house etc to be placed ? and that terrains gets flatten below the house etc if its selected todo that. It seems here is missing link. There is a big difference between a concept for which there is no video in which the generation process is shown, and a real asset. But if you really want it, I will add the ability to place prefabs instead of generating buildings. Please show the code how you use it. and if work can you make that its selectable to use Buildr2 and prefabs also together to get more difference . and if work can you make that it can use houses made manualy with buildr2 to place them also ? Also flatten terrain under the buildings would be good. make that it can be selected if to it at the prefab when multiple to select at what it flat and at what not. if you need i have script and asset for it. Your code you send 1 line changed to not use your box gameobject changed to load a prefab from recource. but why also place the box take 5 hours and buildr2 buildings only take 5 minutes to generate ? also when you add the prefab placement you can make that the not overlay each other ? and a road clipping / etc check that they are not in road like at buildr2 atm. when you think you will integrate it and other we talked ? also when you add the prefab placement you can make that the not overlay each other ? This is the center of Moscow. You see two buildings inside a large building that I cannot bypass when the instantiating of the prefabs. This is not a rare case. This is a common case for cities. and a road clipping / etc check that they are not in road like at buildr2 atm. No. I can not make the road clipping. But I think it will rarely be a problem. Instantiating the prefabs, most likely on next week. Integration with R.A.M. and other long works, in 2-3 months.